Sometimes it’s nice to make a bread that doesn’t have to be kneaded. 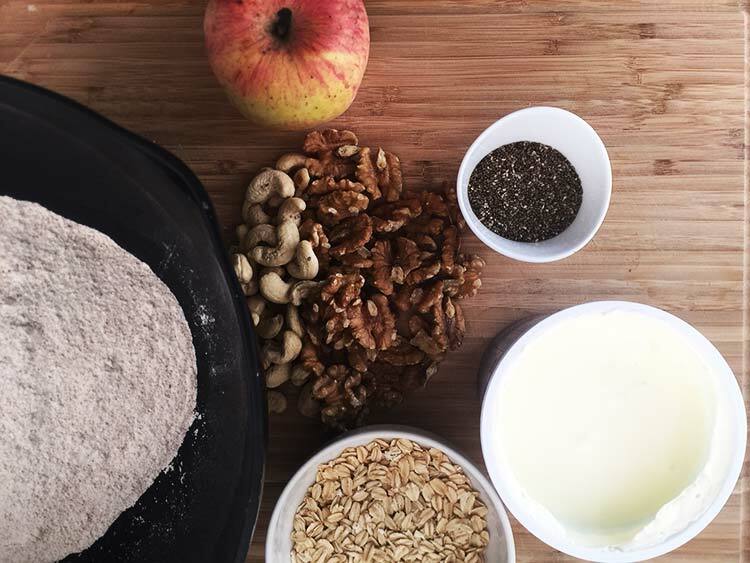 This apple and nut bread is just straight from the bowl, into the form and then into the oven. No yeast, and no waiting for the dough to rise! Nice, huh? 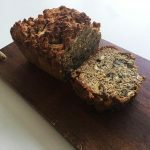 Now, this bread also uses wholemeal flour which makes it really hearty and filling. The apples add a nice natural sweetness and texture and the nuts give it that nice crunchiness even though the bread is soft. To make the bread rise this recipe uses baking soda. In order to activate the baking soda, you need to add some liquid with some acidity to it. I usually use dairy-free yoghurt. 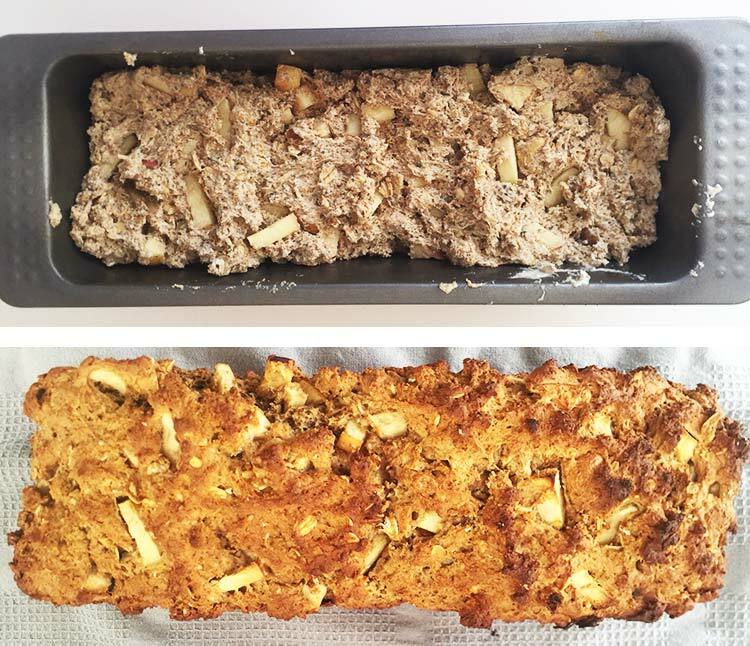 So, if you’re looking for something that can be done within the hour and be able to serve warm, freshly baked bread in the morning, this apple and nut bread is a great recipe for you to use. First, as always, gather your ingredients. I know the bread is going to be delicious just by looking at the ingredients! I use old-school rolled oats in this recipe but you can change it for any types of oats available. As for the nuts, in this recipe, I used walnuts and cashew nuts. 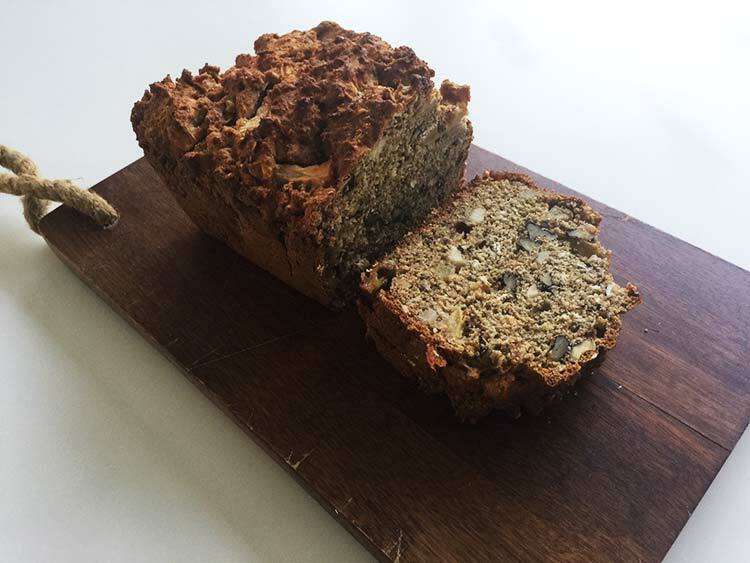 When I’ve been baking this bread earlier I’ve tried different nuts such as hazelnuts, almonds, pine nuts, and pecan nuts. Go with the nuts that you like the most, make the bread your own. 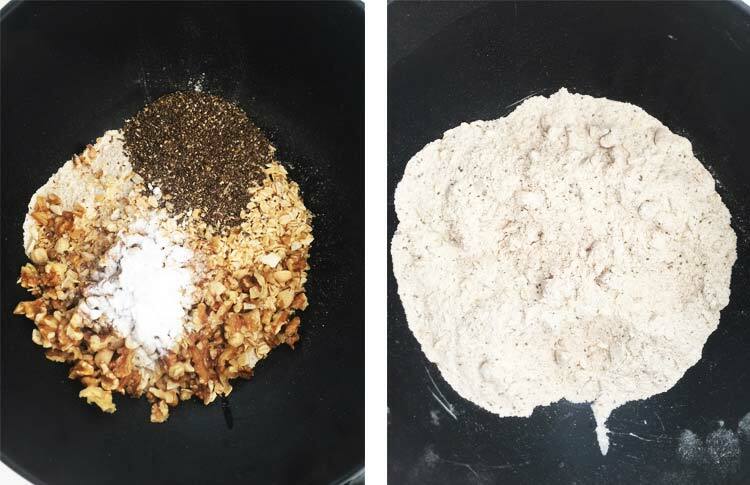 Chop the nuts up roughly then mix all the dry ingredients together in a big bowl. Now it’s time to add the wet ingredients. I consider the apple to be “wet” here even though it’s not liquid. Stir everything so that the dough is completely mixed. It’s supposed to be sticky. Now, the only thing left to do is to scrape the dough out of the bowl and into a bread form and pop it into the oven and wait for it to be finished. There’s nothing more to it, it’s not harder than this to make apple and nut bread. When it comes to toppings only your imagination sets the limit here really. 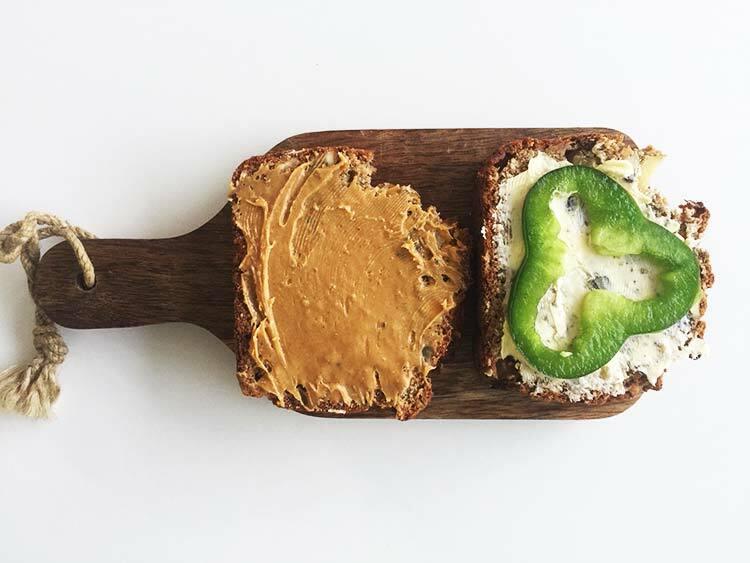 I’ve tried this with an avocado smash, different nut butter, dairy-free butter and vegetables, dairy-free cream cheese and much more. 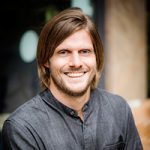 I hope you like this recipe, and if you do, don’t forget to follow me on Facebook, Instagram and Pinterest for news and updates. A perfect breakfast bread that requires no kneading and no rising since it's using baking soda instead of yeast. The wholemeal makes sure that you feel properly filled. Start by heating the oven to 175 °C / 350 °F / Gas Mark 4. 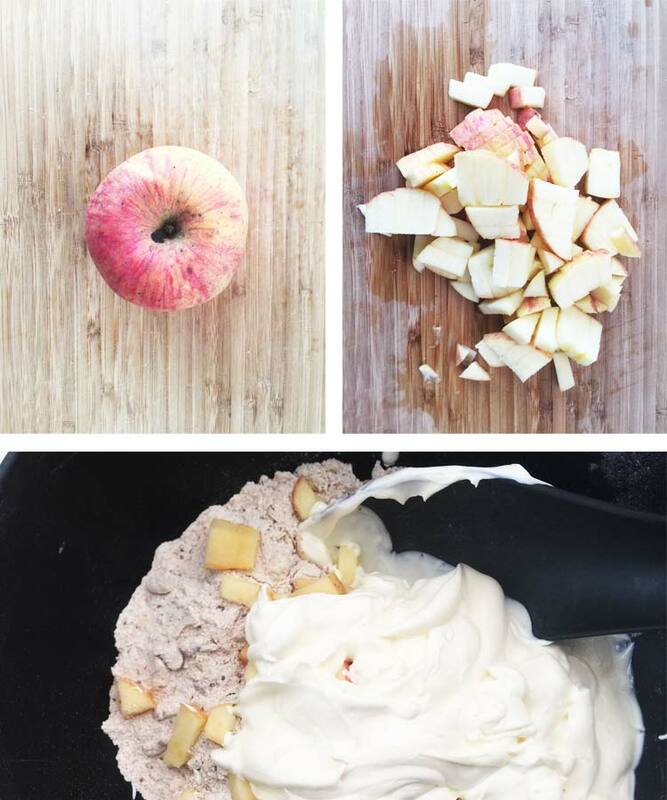 Dice the apple and add it together with the dairy-free yoghurt, and mix until you have a sticky dough. Use the canola oil to grease up a bread baking form and then scrape the dough into the form and spread it evenly. Pop into the oven and bake for about 50 minutes. It's ready when you stick a sharp knife in the middle and it comes out clean. Let the bread cool a little bit before cutting it.